By the time the Brothers Garza were through with their blistering 70 minutes of hard-driving, loud-hollering, ferociously raucous set on Tuesday night, they could’ve owned Toronto. Or at least Metro Square, and they certainly could leave town knowing they’ll command a higher price next time they roll into the Phoenix or the Sound Academy. The Garzas, aka Los Lonely Boys, tore up the 2011 Toronto Jazz Fest with the sort of tunes that make traditional jazz fans cringe and critics ask, “Why are they here?” Good music is good music, though, and downtown Toronto could do with even more nights similar to the ones provided by this year’s edition of the festival. No one outside Metro Hall was asking what genre of music Los Lonely Boys were categorized under. They just wanted more of it. The thousand or so paying fans jammed under the tent and the hundred-plus outside on the lawn gave them a standing ovation — not their first of the night — as they walked off the stage. Toronto loves Texas rock ’n roll — going back to the days of Stevie Ray Vaughan & Double Trouble — and Henry, Jojo and Ringo Jr., who hail from San Angelo in the Lone Star State, won a lot of new supporters as they opened things up for Los Lobos on Day 5 of a festival that’s already had big highlights (Aretha Franklin’s huge crowd on opening night, the Stax! band’s fantastic show on Saturday and Robert Cray’s virtuoso performance on Monday). 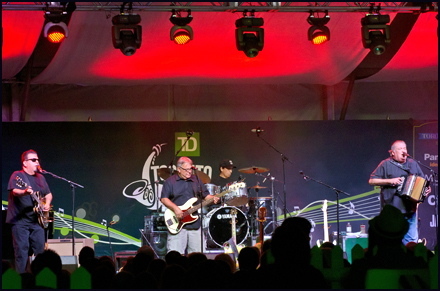 Along with songs from their fourth album “Rockpango,” Los Lonely Boys had some fun with snippets of “Billie Jean” and Cream’s “Sunshine of Your Love” at the start of the night and later got the crowd dancing with a cover of Steve Winwood’s “I’m a Man (and I Can’t Help But Love You So).” Oddly, the quietest moment of the set was on the band’s 2004 hit “Heaven,” played at the end. It’s a great song, but you can tell these guys want to rock out and they have the chops to do it. Whenever they come back (some smart concert promoter will get them in here during the fall), make sure you grab a ticket to the show. As for Los Lobos, they mixed blues with conjunto, bouncy Buddy Holly-style ’50s rock, Latino folk songs and, of course, “La Bamba.” Again, not much jazz, but great stuff, nonetheless, from this East L.A. band that has been around since — are you ready for it? — 1973. They closed the show near midnight with what lead singer David Hidalgo called, “The only Canadian song we know.” Which turned out to be Neil Young’s “Cinnamon Girl.” But we know Los Lobos is intimately familiar with a lot of great Canadian music. 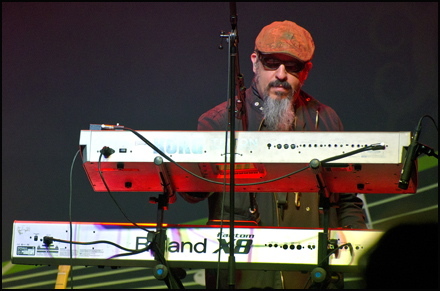 Keyboardist Steve Berlin helped produce the Tragically Hip’s “Phantom Power” and “Music at Work” discs. The Jazz Fest continues with the Count Bassie Orchestra featuring Molly Johnson on Wednesday.